Located on the beachfront in lively St. Lawrence Gap, Rostrevor Hotel features an outdoor pool, sun terrace and gym. Each air-conditioned studio has a kitchenette and a balcony with sea views. Located on a sandy private beach overlooking the Caribbean Sea, this resort offers tennis courts and suites with a complete kitchen and private balcony. It is 10.6 km from Bridgetown. 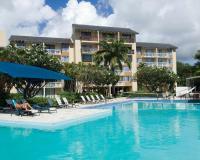 Blue Orchids Beach Hotel is located on Worthing beach, on Barbados' south coast. It offers a gym, outdoor pool and free Wi-Fi. Studios feature a terrace with beach and ocean views. Each air-conditioned studio has a fan and seating area with cable. Escape at the Gap is a family resort hotel in the heart of the colourful St Lawrence Gap on the south coast of Barbados. Facilities include 66 bedrooms featuring ocean view, pool view and penthouse rooms, a swimming pool, gym and watersports activities. The superb position at the edge of one of Barbados's best beaches means Escape at the Gap is the ideal Barbados hotel for families. Located on the white shores of Maxwell Beach, this tropical resort provides access to a variety of watersports, massage services and dining options. It features a swim-up bar, 3 pools and a spa. Copyright ©2013-2019 Hotels Online International Ltd. All rights reserved. A HOL-Canvas booking portal by Hotels Online.